This Weekend was Mill and Windmill on the Air event which is quite interesting to me as I started off in a Textile Mill as a Maintenance Engineer when I was just 17 Years old. The Mill was very old and i had spooky experiences during the 8 years i worked there encountering a Ghostly presence on one of the many evenings i was working alone. 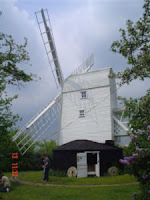 This weekends Event was very good and i would like to thank all who took part and put in the effort of setting up the special event stations up at the Mills and Windmills. Once again many thanks to all involved and a special thankyou to Cliff (GB0WSM) who put a fellow Mill Engineer Derrick on the radio for a good rag chew about Mills and Mill life. I am looking forward to the next time!!! As you can see i am very pleased with my recent delivery of 500 QSL cards from QSL Factory.The Cards have been custom made with a design created by my ever talented YL Louise M3TLL,if you would like one listen out for Me on the Bands and I will send one to You. 73 and hope to work you on Air soon.